Apple is teasing a special one-day online and in-store Black Friday shopping event, but a presumed leak of the offers from 9To5Mac indicates the company will only put on slim discounts on its products. Apple’s Black Friday deals will cover iMacs, MacBook Air and Pro laptops, as well as iPads, iPods and some accessories. As with last year’s Black Friday, Apple is set to offer discounts of $101 for the iMac, MacBook Air and MacBook Pro. 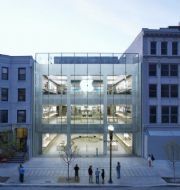 You will also be able to get discounts ranging from $41 to $61 for the iPad 2, depending on capacity, starting at $458. The iPod touch discounts range from $21 to $41, as prices should start at $178. Meanwhile, the iPod nano will be sold for $11 off for the 8GB and 16GB storage sizes, starting at $118. the leather version. Apple is taking $11 off the wireless keyboard and wireless Magic Trackpad too, at $58 each, and you can get $5 off any $50 iTunes/App Store/iBookstore gift card. Apple has yet to confirm these Black Friday deals, but if last year’s offers are any indications, they are in line with previous discounts, which were not steep. However, considering Apple is still selling some of its gear, such as iPad, faster than it can make them, it’s surprising the company is discounting the tablet at all.